Protecting information (discussed in part 3 of this article series). So let us get started on step 2. For servers that run Exchange, we must specify a security group. As such, the default Exchange Servers group that Exchange automatically creates is the best option as any new Exchange servers are automatically added to this group. It goes without saying that the availability of the RMS connector is very important. To ensure that it is highly available, we should deploy two or more RMS connector instances. After we have installed the second or final instance of the RMS connector, we define a connector URL server name and configure a load balancing system. The connector URL server name can be any name under a namespace that we control. For example, we could create an entry in DNS for rms.letsexchange.com and configure this entry to use an IP address in a load balancing system. There are no special requirements for this name and it does not need to be configured on the connector servers themselves. 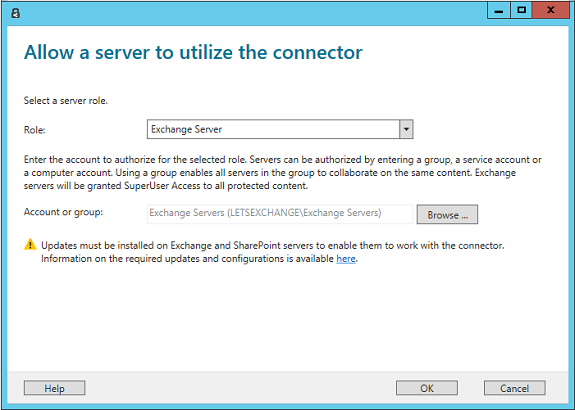 It is not recommended to change this name after we have configured Exchange or SharePoint servers to use the connector, because we would then have to clear these servers of all Information Rights Management [IRM] configurations and reconfigure them. Although the use of TLS or SSL is optional for the RMS connector, it is recommended for any HTTP-based security-sensitive service. This configuration authenticates the servers running the connector to our Exchange servers that use the connector. In addition, all data that is sent from these servers to the connector is encrypted. 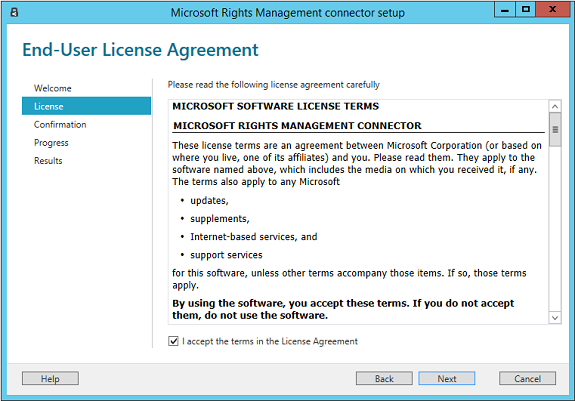 To enable the RMS connector to use TLS, on each server that runs the RMS connector, install a server authentication certificate that contains the name that you will use for the connector. 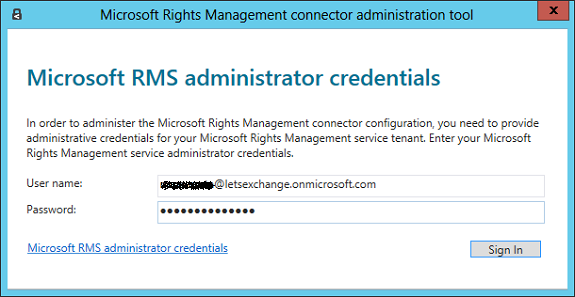 In my example, the RMS connector name defined in DNS is rms.letsexchange.com, so I need to deploy a server authentication certificate that contains rms.letsexchange.com in the certificate subject as the common name, or specify rms.letsexchange.com in the certificate alternative name as the DNS value (the certificate does not have to include the name of the servers!). Then in IIS, bind this certificate to the Default Web Site. If you use the HTTPS option, ensure that all servers that run the connector have a valid server authentication certificate that chains to a root certification authority [CA] that your Exchange servers trust. In addition, if the CA that issued the certificates for the connector servers publishes a certificate revocation list [CRL], the Exchange servers must be able to download this CRL. 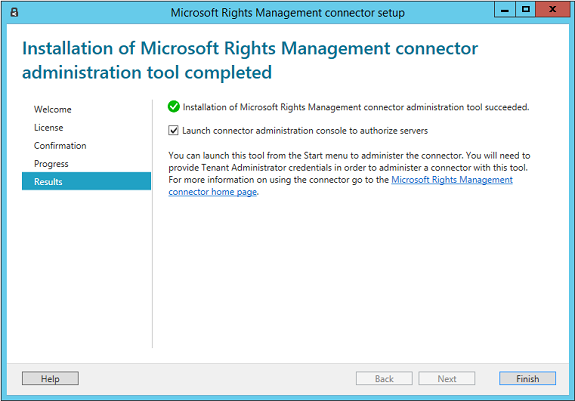 As I have mentioned in the previous article, it is possible to run the RMS connector administration tool from a computer that does not have the RMS connector installed. However, all this gives us is the option to control the list of servers authorized to use the connector (well, that is the only configuration on the RMS connector’s server anyway). 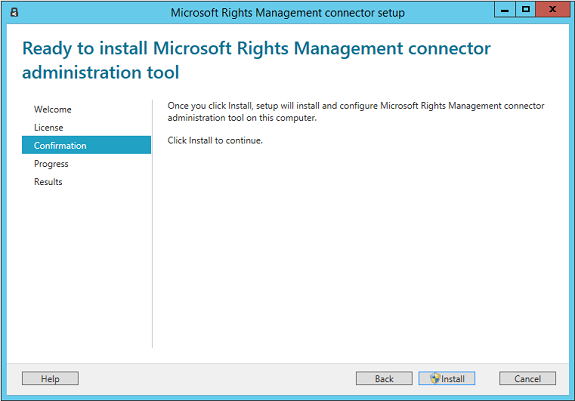 For a 64-bit computer: RMSConnectorSetup.exe. If you have not already downloaded these files, you can do so from the Microsoft Download Center. In this second part of this articles series, we completed the configuration of our RMS Connector. 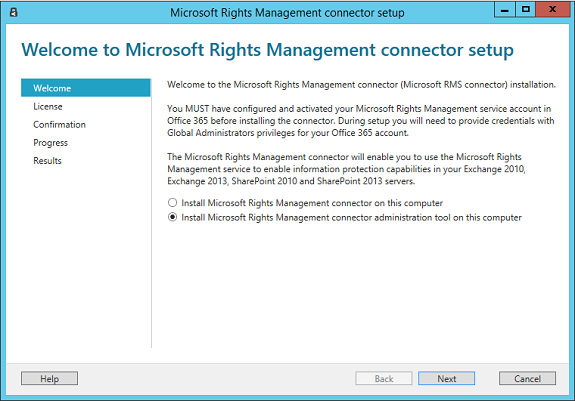 In the next and final part, we will go through the process of configuring Exchange to use the RMS connector.